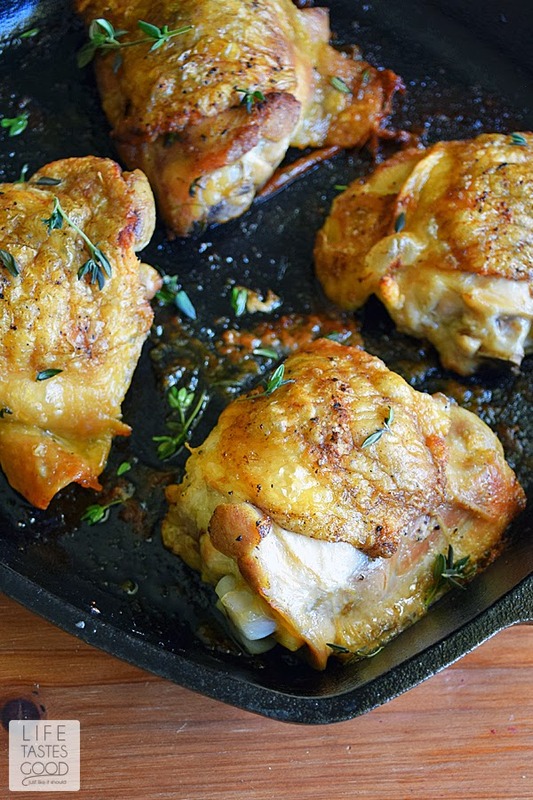 Pan Roasted Chicken Thighs make a simple dinner for any night of the week, but perfect for company too! They are budget-friendly, taste great, and easy to make! It doesn't get much better than this for an easy dinner! Disclosure: Life Tastes Good is a participant in the Amazon Services LLC Associates Program, an affiliate advertising program. Please note: This post may contain affiliate links. 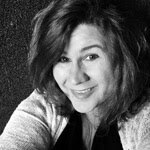 I earn a small commission to help with blog expenses when you make a purchase through an affiliate link. My favorite meals are the simplest ones. They use fresh ingredients and don't take all day to make. That is exactly why I love these Pan Roasted Chicken Thighs. This recipe is a go-to recipe for me! I try to keep chicken thighs on hand for those nights I'm feeling uninspired when it comes to making dinner. Yes, that happens and more than you might think! This dinner is on the table in 30 minutes, and I can pair it with just about anything, but mostly I slap a salad on the side and dinner is done! 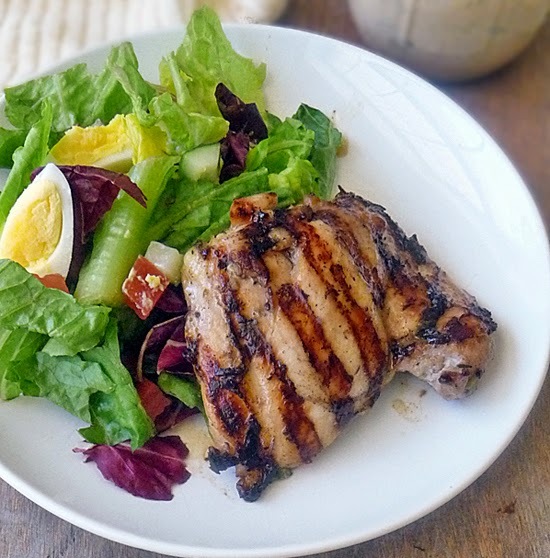 It always makes a delicious low-carb meal that everyone loves! 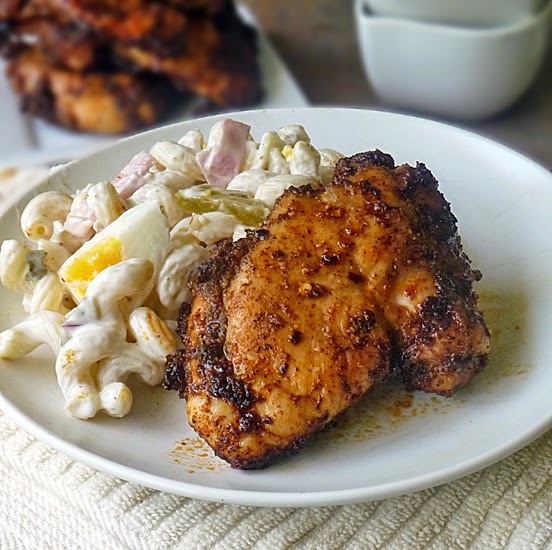 I love the crispy skin on these pan roasted chicken thighs. It is sooo good! Don knows how much I love the crispy skin, so he saves his for me. You know you're loved when your sweetie gives you his crispy skin <smile>. 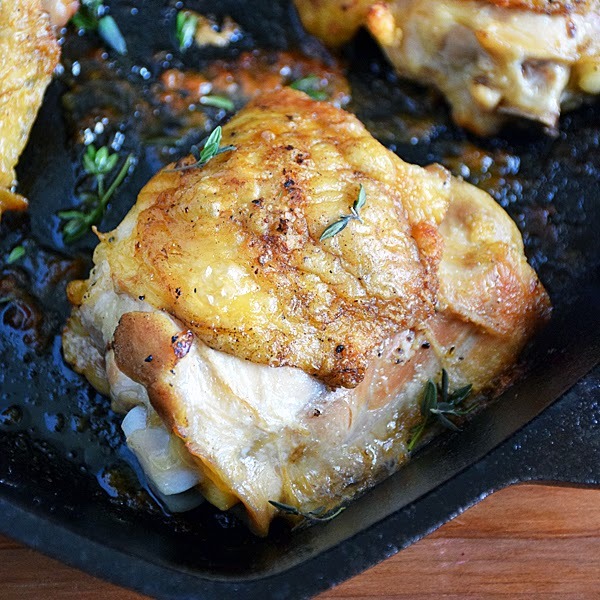 To ensure deliciously moist chicken with perfectly crispy skin, be sure to use a cast iron skillet . You may also use an oven-safe stainless steel skillet with good results, but avoid using a non-stick skillet for this recipe. Combine 1/2 tablespoon kosher salt, 1 teaspoon freshly ground black pepper, 1 teaspoon garlic powder, and 1 teaspoon fresh thyme leaves. Lift the skin and season the meat of the chicken thighs liberally with the salt mixture. Season each thigh evenly. Be sure to season under the skin. Not on the skin. Heat an oven safe skillet over mid-high heat. 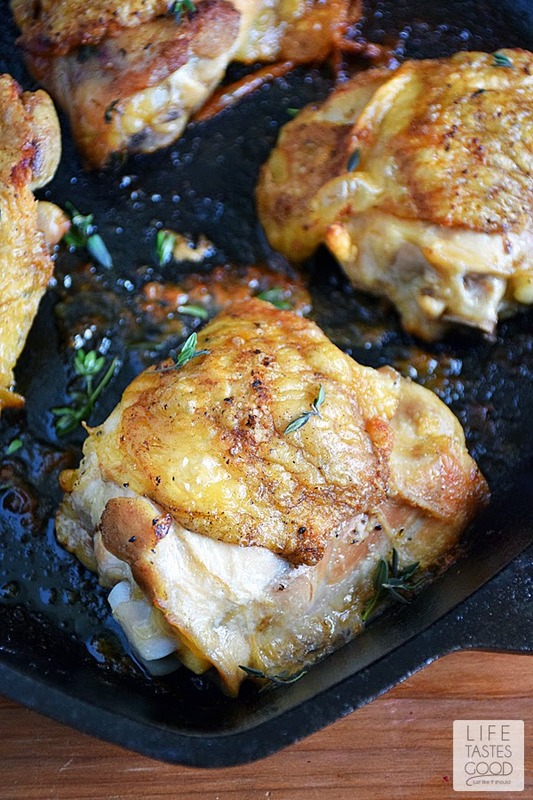 When heated, place the chicken thighs skin side down into the hot skillet in a single layer. I always do this in a dry pan. No need to oil the pan. Allow the chicken to sear, untouched, for 5-6 minutes until the chicken releases without sticking to the pan. Use tongs to gently lift the chicken thighs and flip over each piece. If the skin sticks allow them to sear another minute or so until they release. 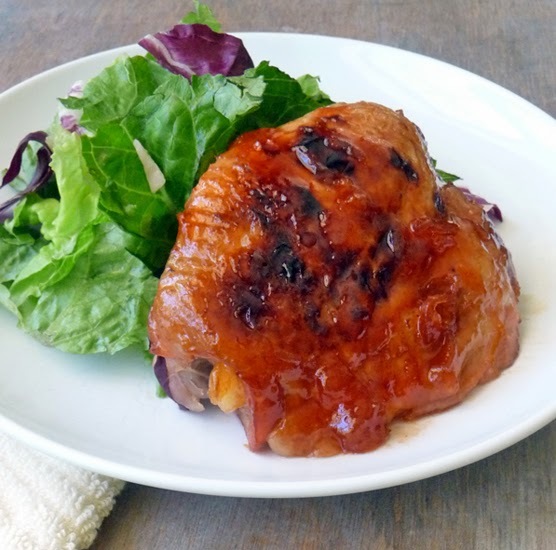 Transfer the skillet to the preheated oven and cook for 20-25 minutes until thighs reach 160° F. Check the temp using an instant read thermometer. 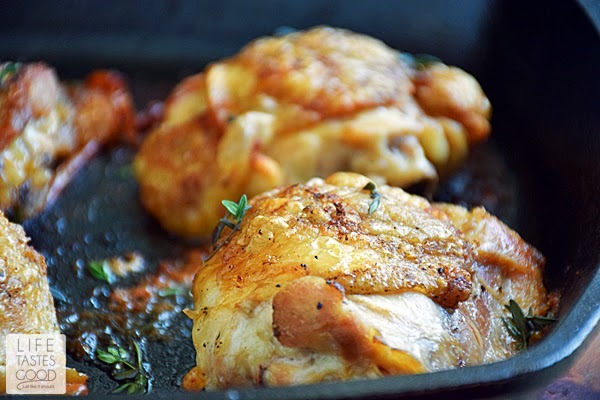 When thighs are done, remove from pan and allow to rest for 10 minutes. Serve and enjoy!